I’m a goal-oriented person (who loves accomplishing dreams). I’m also a creative (who has a tendency to procrastinate). I’m also a passionate communicator who loves the church. I’m also often conflicted (I feel constant tension about “getting it all done” and “I need more time to get it right”). I often get bogged down with HUGE jobs that are required to effectively communicate in the church. I try to practice a “worst first” task management system for getting out of those productivity pressures. 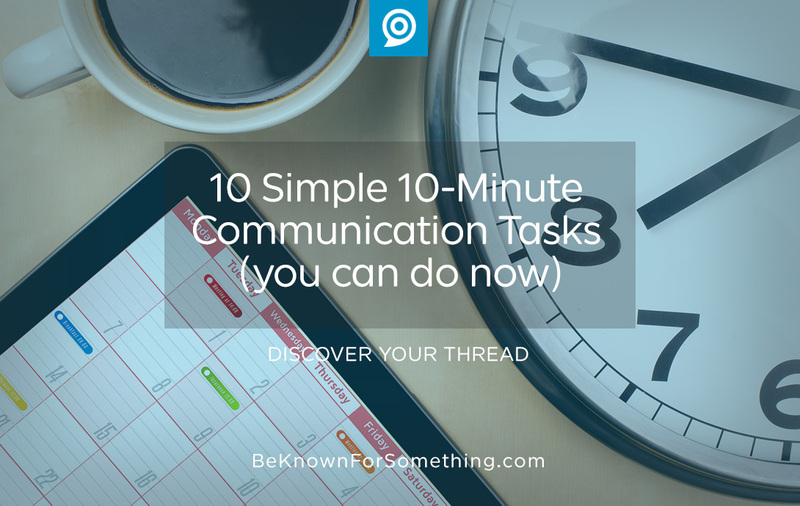 What about those times you only have a little bit of time and you want to improve something by cranking out a quick task? We all have those moments when you wonder what you can do quickly. Pray specifically about something you’re relying solely on God to accomplish. Careful: you may go over 10 minutes! Open your website and see how fast you can find: service times, address and directions, and a good description of what to expect if visiting (the 3 most desired things). Get them fixed. Write a practical “how to” social media post that your church’s followers will find invaluable. What topic? Think about the last sermon that was given. Call (yes, with your phone) a person who mentored you and say thank you. Clean your (physical or digital) desktop and organize. Only leave one job out to work on. Call a ministry leader in your church and ask them what you can pray for. Then do it right then. Walk into the front doors of your church like it was your first time. Eliminate any potential barriers that someone might find odd (smells, sights, sounds). Or add something that’s needed (sign, lighting, chairs). Think of one way to reduce the amount of content in your printed bulletin. Just do it (most won’t notice a small change). Repeat this every month! Think about the most successful event in your church (in the last month or so); call the leader and thank the person for all that was done. Then ask him or her for a quick story that you can share!